I like the Octopus, the rest look a bit stiff to me. I am sure I will warm to them though. I think these could look really good with a head swap - I like the half tree / half elf look, just not all that hair . I think the motion of the hair also is at odds with the rather static / intimidating poses. Also quoting the pics over to the new page! Subject: Warhammer Underworlds - Yltharis Guardians revealed, pg 66! I am surprised by how much dislike this warband is getting. By far my favourite warband aesthetically. I love the metal band hair, the weapon variety, how unique each of them is from the others despite all being revenants. I'm with Zatsuku. 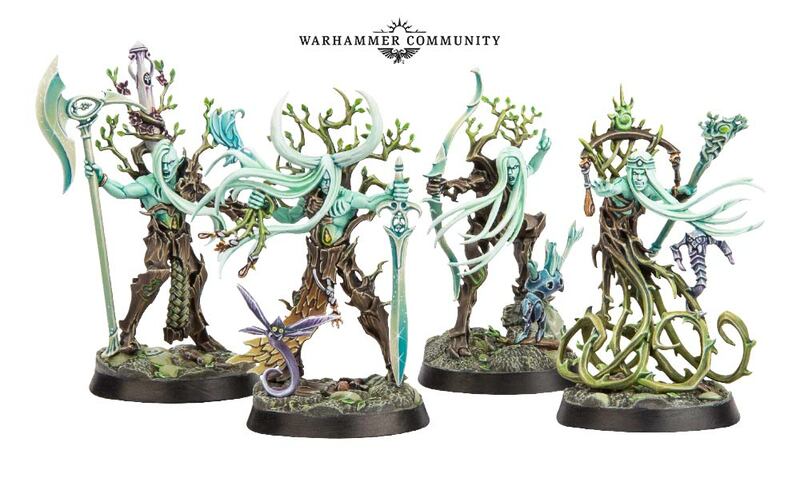 These look like really well-sculpted Tree Revenants. Subject: Re:Warhammer Underworlds - Yltharis Guardians revealed, pg 66! The one with the bow needs a better angle, though, as right now it looks like a hunchback. I like the other two normal ones, not sure how I feel about the leaders octopus-like vine-legs. I'm sorry if I came across as a bit rude. Sylvaneth are the Tree-Spirits, under Alarielle. She's rescued Aelf souls alongside of Morathi, Malerion, Teclis, and Tyrion and they've each been 'allotted' effectively a certain amount of the souls rescued from Slaanesh's crazy End Timesgiving bender. Each of the 'gods' has been effectively 'creating' new Aelf life. She seemingly created the Tree-Revenants to give new bodies to Aelf souls. Morathi created the Melusai(the Medusa units) and Khinerai(harpies) with her allotted souls. Teclis created an early 'experiment' and that gave us the Idoneth. Malerion has created life--we haven't seen it really showcased (yet). Tentatively referred to, early on, as "Shadowkin". Tyrion has created life--we haven't seen it yet. Then you have the 'remnants'. Wood Elves became the Wanderers. They no longer have any 'Forest Spirit' units with them--and lost a bit of their luster from the units they lost(Wardancers, Scouts, Glade Riders, Warhawk Riders and Great Eagles) or had changed(Waywatchers were changed from a unit to a Hero choice and it's not awful but it's not great). Darkling Covens is where the Sorcereresses, Executioners, Black Guard, and the Warriors ended up. Scourge Privateers got the Beastmaster Chariot with ballista, Kharibdyss, Corsairs, and Fleetmasters. Shadowblades is a two unit faction(for now) that consists of Dark Riders and Assassins. Ordo Serpentis is the Drakespawn(Cold Ones) Chariots, Knights, Black Dragon riding Dreadlords, and the War Hydra. Daughters of Khaine is the Witch Elves and Morathi's personal faction now. Phoenix Temple is the Phoenix Guard and Phoenixes. Swifthawk Agents is Shadow Warriors, Skycutter Chariots, Spireguard(Lothern Sea Guard--models are discontinued though which is just naff), and the horse drawn chariots. Lion Rangers are the White Lions and Lion Chariots. Ordo Draconis are the Dragon Princes, Dragon Mages, and Dragon Lords whether on horse or dragon. Eldritch Council are Swordmasters, Loremasters, and Archmages. They are, but that's all they are. They don't expand the setting like Mollog does or basically preview an unreleased faction like the Godsworn Hunt or Zarbag's Gitz. A bit too “anime” for my liking. Not hard to change that though- a simple head swap will do it for me. Something from the Death Allience will do. Or maybe convert necks into tree stumps and leave it at that. Looks like good basis for a blood bowl wood elf team to me. I like those - some original vibe, and interesting execution. But, we knew that from the art. Most of the warbands are just things that already exist. Mollog, Godsworn and Zarbags Gitz are the exception there. Not a massive preview/expansion for sure. But they are running with a few things that existing AoS Revenants don't currently have. The axe, bow and staff are all new, as are the vine legs. So unless this warband are a special case(entirely possible), we could be looking at a preview for another round of Sylvaneth. What we need is a warbands with magic where the Leader isn’t automatically the best/only Wizard. Say a Freeguild band set up like a traditional D&D adventuring party; Fighter, Ranger, Wizard, Thief, Priest, maybe a pet, with either the fighter or ranger as leader. How can Underworlds become any more stream-lined and simple to play? This seems unnecessary. I don't get what makes it "aimed at new players". 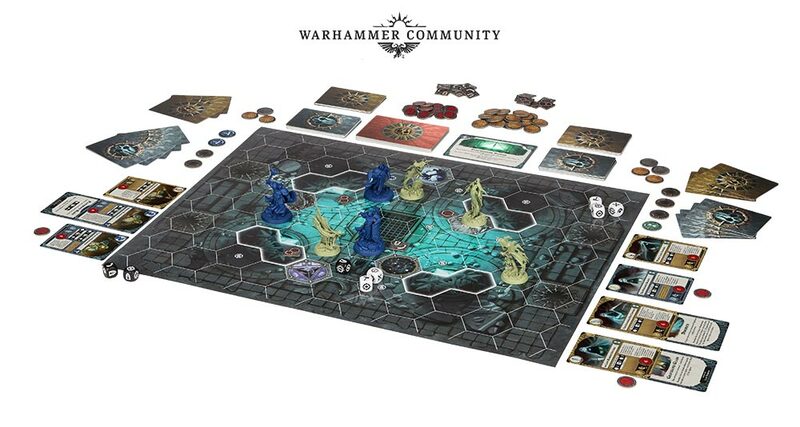 Looks just like Shadespire, except with extra rules for hazards. Maybe it leaves out the deck building element and only contains set decks for the two factions? I'm guessing it's in response to Gambit Spells being a bit more of a complex element(at least from feedback they've gotten). Well, there is a deck of red-backed cards along the top of the map..
Not sure.. is the map new too? I'm thinking that's where the "hazards" are. They're wider than the normal cards and oriented landscape rather than portrait. I don't think so? It looks like the first board set. I'm thinking the red deck of cards are the "hazard" deck of cards. 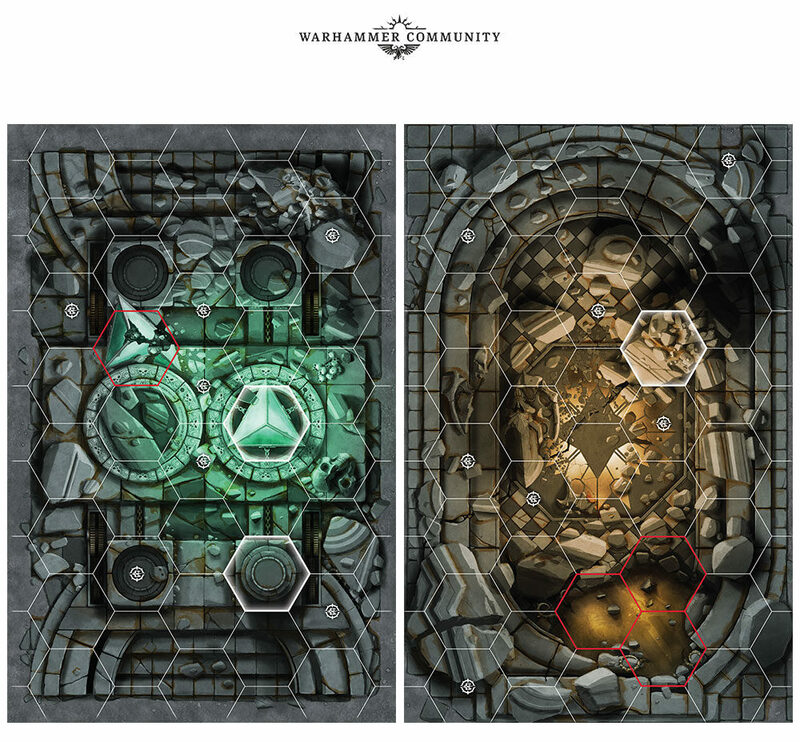 The board is new, it is very symmetrical deployment and block terrain pieces. Looks like this version they only play one board instead of two boards normally. All of the Warhammer Underworlds sets have been ETB. When they started selling them sans cards, they labeled them Easy to Build. Every single Underworlds kit has been ETB. For a starter set it's even more important I guess. I wonder if it'll be a lot cheaper - maybe £20? If it's not having to absorb the cost of the sculpts and molds then they could get it pretty cheap. On the one hand, oh yay, more Stormcast. Just what the game needs. And Stormcast models that were already being used for variety's sake to replace Steelheart's models. And this means we'll probably have a fifth Stormcast faction when the Season 3 starter comes out. One the other hand, the new ghosts look interesting. Seems they they have two 4 health and two 3 health fighters, and they get more text when they inspire. And they all have 2 Dodge? The uninspired text probably lets them move through blocked hexes. Maybe doing so is their inspiration mechanic? 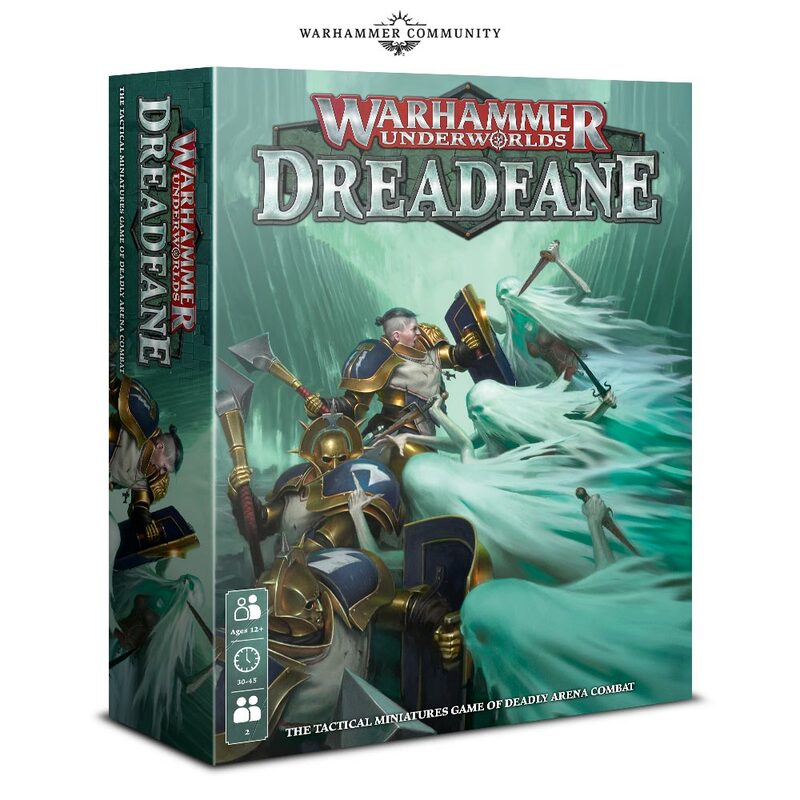 I'll probably buy this just to get the new warbands and potentially cards, and probably toss the rest. It may be useful if it comes with fixed deck instructions for the other Underworlds factions, since it'd remove the deckbuilding aspect that leaves some prospective players cold. Also, if ETB = potential Underworlds warband, we ABSOLUTELY need to see the Dreadblade Harrow kit become a two-man cavalry based faction. New board up for preorder next week. The elves look odd and it's a shame there's no High Elves or Dark Elves. Seems like we will have to wait a long time for something like that. Dreadfane I'm optimistic about, because I only own Steelheart and Farstriders. I hope it will be a anew faction, not a reskin.